The tax reductions will result in a revenue loss of about Rs20,000 crore a year, but It is one of the biggest concessions announced after the new indirect tax system took effect on 1 July. 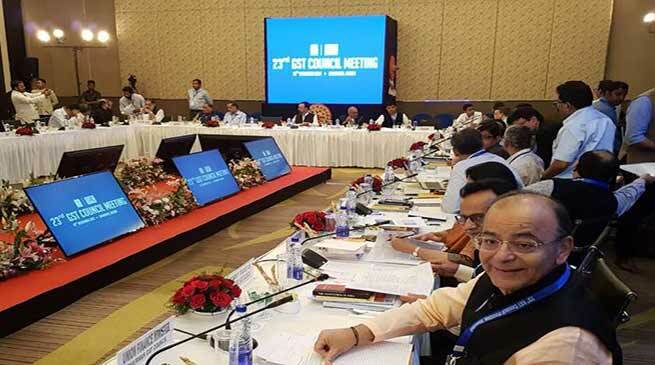 The GST council held the meeting in Guwahati on Friday to look into the revision of rates and easy filing of returns, but more importantly to find ways of providing relief to small enterprises. The tax rate was reduced on a range of goods—from granite and marble to chewing gum and chocolates, deodorants and detergents. A panel, headed by Assam Finance Minister Himanta Biswa Sarma, has suggested doing away with the differing tax rates between AC and non-AC restaurants, and instead proposed a uniform tax rate of 12 percent. Currently, for non-AC restaurants, GST is levied at 12 percent while it is 18 percent for AC restaurants. The GST Network also said businesses can now make changes to the forms uploaded on the portal to claim transition credit. “The facility to revise Form GST TRAN-1 declaration has been introduced on the GST Portal for taxpayers who had already filed it prior to 9 November 2017,” GSTN said in a statement. The government in September allowed for one-time revision of TRAN-1. The facility to revise TRAN-1 declaration has been enabled for taxpayers who had already filed it, said GSTN, the company which developed the IT backbone for the new indirect tax regime. Revision can be either an increase or decrease of credit in comparison to the original credit. If the revision is to reduce the credit claimed previously then the taxpayer will be able to file only if he has sufficient balance in his credit ledger,” GSTN said. The tax cut is aimed at making the new indirect tax regime more acceptable to people and to reduce the burden on businesses. Although the tax burden on the items in the highest tax slab was comparable to the tax burden in the erstwhile government, many small businesses with annual sales up to Rs1.5 crore had enjoyed excise duty exemptions in that system. Since businesses with Rs20 lakh annual sales come under the GST, these small units were beset with a higher tax burden, which the council has attempted to correct.